sport, and like to be active and healthy. But for the last year or so ( DO NOT DO POWERLIFTING ANYMORE) i am totally miserable, and feel like somebody that never did sport in his whole life. Maybe a would be better off not doing sport at all, as i see people with more energy and less pain that never were active in their life. I have a spasm in my left latissimus, it seem to start in the left hip joint and then affects, the lats, then it goes down the side of my left leg and even into the calf muscle. In the morning the first 5 steps is like an old man, both feet are painful, and feel stuff even if the pain goes. I feel like impinchment of a nerve in the area by my pelvic or lumbal vertebrae. I am a bit off balance and i feel that i am much stronger right than left, and i do belief that the powerlifting caused a imbalance in my body, that need to be rectified. The other day i stand on a foot pressure machine at a sport shoe shop, just to make sure and i was right i lean more over to my right, as the pressure was almost 10% more on my right leg than the left. The spasm is permanently there, and i am about 90% of the day in pain or uncomfortable, i am so use to the pain, that i can bare it, but i want to get fixed, as i want to do some other nice things like running, or cycling with my wife and be active. This pain and aching, causes me to be a bit less energetic, and i feel sometimes warm almost like a fever i think it is the inflammation the spasms cause me. Can you please help me, i have tried a number of things: Fisio, stretching (which is painfull), Acupuncture, a bit of Muscle or skeletal Manipulation. Note: George has answered a number of followup questions that I asked of him to help narrow the range of possibilities. Power lifting would have to be one of the most stressful pastimes one could imagine as far as the back is concerned. It is a marvel of nature that the spine, delicate and fragile as it is, can bear such extreme loading as depicted in the photo to the above right. But does it? I do not think so because I have come across more than a few power lifters in my time who have wrecked their backs, knees and shoulders. We assume that all power lifters have biomechanically perfect technique, are in superb physical condition. 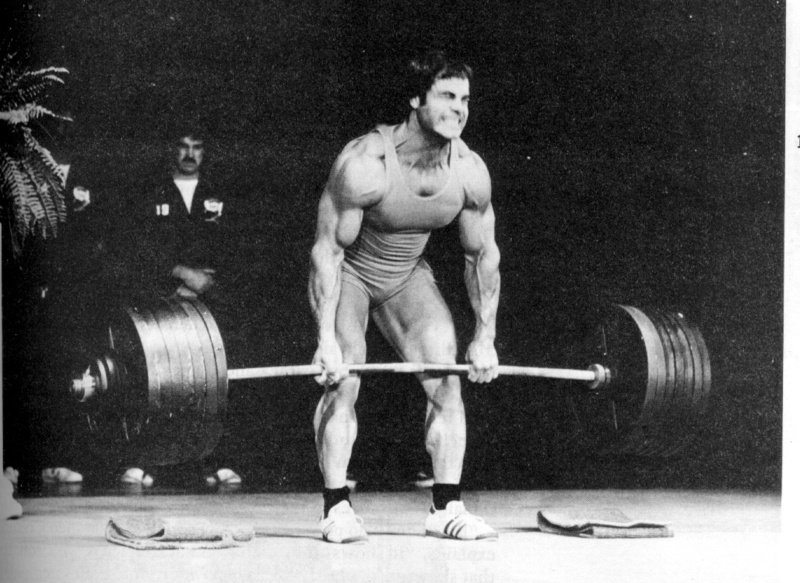 The reality is that few lifters are perfect and few are in the kind of physical condition as the lifter in the photo. The nature of the sport is to push the limits and it takes only one lift to do serious damage. This serious damage may also be in the form of repeated micro trauma that does not disable until several years have passed, or as the resilience of youth begins to leave us. One does not have to "pop" a disc to cause serious back pain. The Annular Ring is a source of back and sciatic pain. The annular ring is the ligamentous "band" that is the outermost layer of the disc. 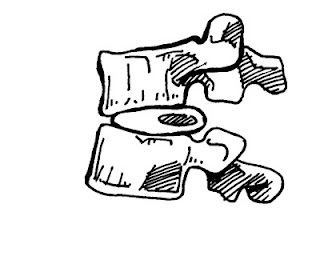 The intervertebral disc separates the bony spinal vertebrae, providing a shock absorber effect and enabling movement. 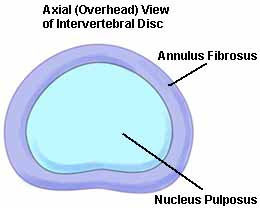 The disc contains a dense fabric of nerve fibers and inflammatory proteins that can greatly increase pain and suffering. Annular tears are common and most of the time these go unnoticed. But if the tear is big enough or deep enough, severe back pain may be the consequence. The rings themselves may cause severe back pain or indirectly by allowing the disc contents to protrude into the spinal canal, impinging the spinal cord, causing back pain and sciatica. Unfortunately, there is little medical evidence that these disc injuries heal. Treatment is mostly about ongoing management and preventing further damage. George, I suspect you may have caused repeated damage to your spine which is the source of your left-sided pain. The first course of action is to see about getting a referral to a medical specialist such as an orthopaedic surgeon to get the right tests and a proper diagnosis. Once you know exactly what you are dealing with, you can then be more certain about what to do over the short and long term. You will need to go see your regular doctor and discuss getting a referral. The alternative is to consult a local doctor with training in sports medicine. Do not lift any heavy weights - go for light conditioning and boost cardio fitness instead. Have a serious look at your diet and get rid of any junk that you can identify - confectionery, processed meats and grains, soft drinks, sports drinks, coffee and so on. Go all natural! Take a quality B vitamin complex which may be beneficial for the nerves and may help reduce any nerve inflammation. Do a course of supplementing with a quality magnesium supplement which may reduce muscle spasms and calm the nerves. Add about 2,000 mg of vitamin C per day. You might benefit from reading my book on back pain and following the exercise routines in it. These help to maintain a healthy and flexible spine. Try a twice weekly course of massage to reduce muscle tension. These measures should help give some relief while you are in the process of finding out what may be the problem. Good luck George - all the best - and please keep us posted as to progress.